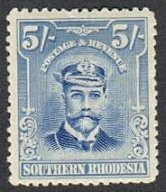 This section of the website was previously under Southern Rhodesia and was perhaps overlooked by many and it has a more appropriate place in The Rhodesian Philatelist sector. 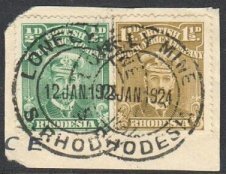 Collections of Southern and Northern Rhodesia invariably start with their first definitives, issued on 1st April 1924 and 1925 respectively. What many Individuals do not take into account is that Southern Rhodesia was granted Self Government on 1st October 1923 and from the 1st April, 1924 Northern Rhodesia was administrated by the Imperial Government under the direction of the Colonial Office. These two dates mark the end of the British South Africa Company's administration in the two territories. Leading up to the above events the British South Africa Company wished to dispose of the remaining stocks of stamps held by the Company in London and as early as July 1923 they had approached certain dealers in England with the view to disposing of their holding. Stanley Gibbons acquired this stock and the first details of the transaction was disclosed in the Stamp Collector's Fortnightly dated 29th March, 1924. This was followed by an explanatory statement by Stanley Gibbons in their April edition of the Monthly Journal. They stated that no remainders of the 1913-22 King's portrait were either offered or available for sale. 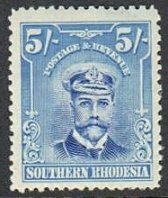 This is quite understandable as the Admiral issue was still required for postage and revenue purposes in Northern and Southern Rhodesia for an interim period from the end of the BSAC Administration until the issue of new definitives in each Territory. 1st April, 1924 to 31st March, 1925. It is assumed that it will be desired to issue an entirely new set of stamps and to place that issue on sale locally as soon as possible after the 1st of October next. It is very doubtful if it would be feasible to put the new issue into circulation by that date owing to the short time available. During the period which may elapse between the 1st of October and the introduction of the new issue I would suggest that the existing stamps be made use of in their present condition and without surcharge or overprinting of any description. If this be decided on it will be necessary for the British South Africa Company to forward the whole of the remaining stocks held by their London Office to this country and that no more shall be printed except at the request of the local Administration, the requirements of Northern Rhodesia being met from here. When the new issue has been placed on sale and the question of the stamps to be used in Northern Rhodesia after the 1st April next has been decided the whole of the remaining stamps of the present issue should be destroyed in the presence of senior officials of the Auditor General's and the Postal Departments who will certify accordingly. The existing dies should also be sent out and similarly treated, or a certificate of destruction be obtained from Messrs Waterlow and Sons. The PMG’s letter goes on to provide details of the suggested denominations for postage and revenue stamps plus the postal stationery requirements and also suggested: As regards design I would suggest that it be as simple as possible and that the design at present in use would be quite suitable provided the words "British South Africa" be replaced by "Southern Rhodesia". In the concluding sentence he wrote: ‘I may add that I agree most unreservedly with the opinion expressed in the letter from the Philatelic Society as to the extreme undesirability of sanctioning any surcharge or overprint if the temporary use of the existing issue is continued after the 30th September next. 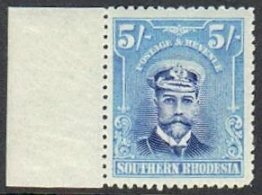 All stamps used between 1st October 1923 and 31st March 1924 may be described as Southern Rhodesia provisionals or forerunners and only examples with readable dates can be placed in such a category. The only stamps that I have encountered, used during the interim period, have been from the Admiral issue. Self Government took effect on Monday 1st October 1923 with Sir Charles Coghlan as the First Premier. The interim period for B.S.A.C. 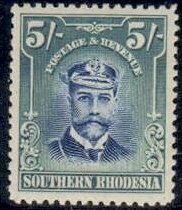 Admirals was six months and Southern Rhodesia's first definitive was placed on sale Tuesday 1st April 1924. 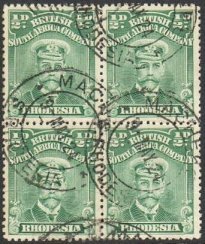 The Admirals were withdrawn on 31st March, 1924 and remained valid for postage for a further month until 30th April, 1924. A further five months of grace was allowed during which time the stamps of the old issue could be exchanged for those of the new issue. 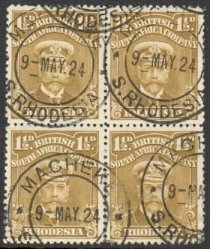 Late Usage is known on numerous singles, pairs, blocks and larger multiples all cancelled with a double ring MACHEKE 9 MAY 24, in my opinion they were almost certainly executed by favour. The B.S.A.C. Postal Stationery also remained in use during the interim period. It has not been established whether the same rules applied to the stationery regarding the dates of withdrawal, exchange and demonetization and the postal notices seen specifically refer to the stamps. 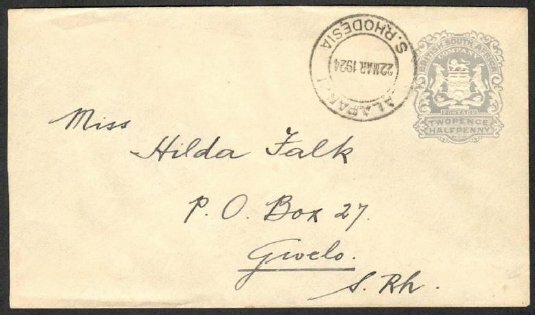 P. Falk, a 2½d Arms envelope H&G 3 used LALAPANZI 22 MAR 1924 & a 1d+1d Small Arms Post & Reply card H&G 12 used GWELO 10 DEC 1923. Registered envelopes with Admiral Imprints do not exist. 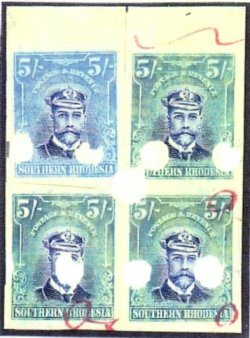 The ½d Admiral Newspaper wrapper, virtually all used examples seen are dated during the interim period and I have only encountered one cancelled prior to 1st October 1923, the date being DEC 1922. Postal Notice 17/1923 TARN ESTATE closed 11th September 1923. CHRISTMAS PASS Open 11th February 1924 (PN5/1924) closed 1.3.34. ZAKA Opened by 31st December, 1923. Opening confirmed by P.N.5/1924. 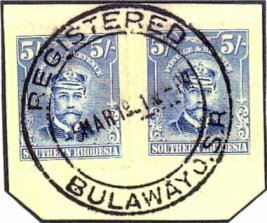 A New Self Governing Southern Rhodesia issued their First Definitives on 1 April 1924 and they remained in use for seven years. The Stanley Gibbons Commonwealth Catalogue lists it as SG 1 to 14, suggesting it is a dull and straight forward set of stamps. The truth is far from that, with sixty six plus printings it offers the specialist the challenge to seek all the various shades. Some items are great rarities, for instance the 1927 1d Rosine, difficult used and virtually impossible mint; I have only had one example of it. 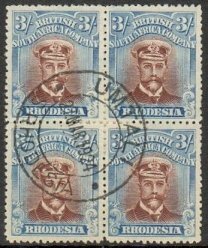 The 1928 5/-, only four sheets, 240 stamps printed specifically for the Stamp Trade and distributed in ordinary sets to collectors. Many of them are still part of ordinary collections with the owners oblivious to the fact that they possess a rare stamp. 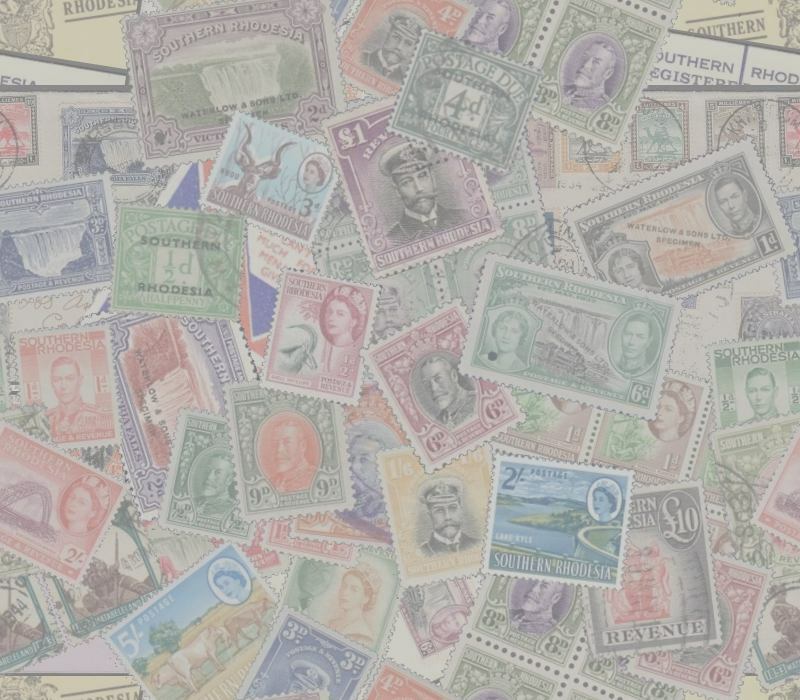 Only recently a friend informed me that he had bought a set of fourteen stamps from a dealer in Canada as he suspected that the top value was indeed the rare 1928 printing. After seeking verification, it proved to be so. In 1929 a 1d coil stamp was issued and very few distributed via the vending machines as they would not work properly. It is very common mint and very scarce used and to locate a copy on cover a challenge of a lifetime. Part Imperforates and imperforate between varieties abound, the former being beyond the scope of the SG catalogue and the listing of the imperforate between varieties is incomplete. During the period that the Admirals were for sale several small Postal Agencies opened and/or closed. The foregoing means that there are some Extremely Rare Postmarks worth looking for on this particular issue. Single perforated proofs were hinged onto an album page in sequence of value and the print order of each proof has a number in pencil on the reverse so that they cannot be mixed up should they be taken off their page. These archival collections consist of 65 punch hole proofs mounted on two album Pages and each unit is accompanied by three tabulated pages that provide the details of Printing dates, quantities ordered and plate numbers used. It is the only publication to list the rare 1928 5/- shade as G14b - Then priced at £1750 mint & quite correctly did not price it used and in my opinion it does not exist in a used state. The February 1928 5/- was for a total of four sheets only prepared specifically for the stamp trade & it is thought that Ewen's New Issue service distributed this printing. was finally quoted at £18 in the 1940 edition. Chemically manufactured error - The 5/- value is also catalogued blue and light blue and is described as “an error of colour” of which only two sheets. i.e. 120 stamps were printed, but this error has been chemically “manufactured” and it, behoves all collectors to seek expert advice before purchasing what purports to be a genuine specimen. Many specialists contend that this stamp should never be chronicled as an “error” but merely as a separate shade variety. Nearly fifty years later the opportunity arose for me to examine the file proof sheets kept by the printer and in the top row of the imperforate registration sheet was a single copy which had been cut out and replaced after treatment, showing that the printers had been approached at the time and proved that the light blue stamp was a fake. Although the former Error of Colour proved to be a changling, it is still highly sought after and sells remarkably well in Auction and in the Ivy, Shreve & Mader SAMOS London sale 20 June 1991 - An example in lot 1245 sold for £500 - the buyer was the well known dealer and now the late Billy Lea. SOUTHERN RHODESIA – Postage Stamps: New Issue. It is hereby notified for public information that a new issue of postage and revenue stamps and stationery will be on sale at all post offices on 1st April next. 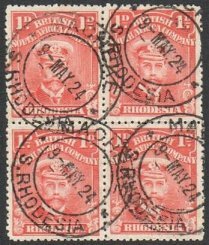 Stamps of the present issue will be valid for postal and revenue purposes until 30th September, 1931, after which date such stamps and stationery will become obsolete and will cease to be valid. Mail matter posted after the 30th September next which bears stamps of the obsolete issue will be surcharged. Stamps: ½d, 1d, 2d, 3d, 4d, 6d, 8d, 10d, 1s, 1s 6d, 2s, 2s 6d and 5s. Post cards with ½d and 1½d stamp. Registered envelopes, large and small, with 4d stamp. Embossed envelopes, large and small with ½d stamp. Embossed envelopes, small, with 1d stamp. Newspaper wrappers with ½d stamp. Letter cards with 1d stamp. Books of stamps containing ½d and 1d stamps, value 2s 6d each, will also be available.